There is a profound reduction in all immunoglobulin classes; B cells and plasma cells are reduced. The defect is in the differentiation of pre- B cells into B cells; T cells are normal. It typically presents with infections, e.g. meningococcal meningitis, mycoplasmal infections, after the first 3-6 months of life, when the protection from pass ively transferred maternal antibody has largely been lost. Immunoglobulin replacement therapy is very successful and is now generally given intravenously. Many patients treat themselves at home. This is a late onset antibody deficiency, which may present in childhood or adult life. IgG levels are especially low. 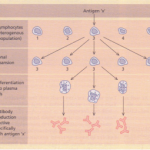 B-cell numbers are usually normal; the defect appears to result from failure of their further differentiation. Some tests of T-cell function may be abnormal but few clinical manifestations of T-cell immunodeficiency are documented. 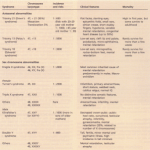 The patients have similar infections to those with the Xlinked variety. However, a particular feature is follicular hyperplasia of lymph nodes, which in the gut takes the form of nodular lymphoid hyperplasia, and there may be splenomegaly. CVI patients may develop autoimmune disease and there is also an increased risk of Iymphoreticular malignancy. The finding of reduced immunoglobulin levels and normal B-cell numbers indicates the diagnosis. Most of the manifestations are satisfactorily prevented by regular immunoglobulin replacement therapy. IgA deficiency This is an extremely common disorder but is often symptomless. Only a small proportion have an increased risk of pyogenic infection and many of these have another defect, such as IgG2 subclass deficiency. Some have allergic disorders or gluten hypersensitivity, and autoimmune disorders may also occur. intravenous immunoglobulin replacement provides effective restoration. 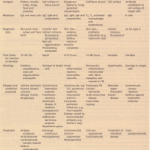 A variety of other rare immunoglobulin deficiencies exist, including hypogammaglobulinaemia with raised IgM, in which there is a defect in isotype switching. Some patients with increased bacterial infections have apparently normal levels of immunoglobulin but fail to produce specific antibodies to certain organisms. This is seen in the immune paresis of patients with myeloma and chronic lymphatic leukaemia or lymphoma. Infection with capsulated bacteria may be seen, especially with myeloma. Splenectomy causes impairment of defence against capsulated bacteria, especially pneumococcus, partly because T-independent antibody responses are largely made in the spleen and partly because of its role as part of the fixed reticuloendothelial system. Hyposplenism associated with severe sickle cell disease is responsible for the increased risk of infection in such patients. Pneumococcal vaccination before elective splenectomy and the use of penicillin prophylaxis can largely eliminate risk of serious infection. Hypogammaglobulinaemia can be seen in congenital rubella. A defect of branchial arch development leads to abnormal thymic development. This is of varying severity and is associated with other branchial arch defects: dysmorphic facies, hypoparathyroidism and cardiac defects. Patients present with infections including mucocutaneous candidiasis and Pneumocystis carinii pneumonia, together with chronic diarrhoea, due to a variety of pathogens. The absent thymus can be documented radiologically. CD3 T cells are variably reduced in number, but the CD4 subset is usually reduced and T-cell proliferative responses are impaired. Immunoglobulin production is typically normal. Thymic transplants and thymic hormone have been reported to have reconstituted some patients with severe disease and bone marrow transplants have also had some success. By far the most common immunodeficiency encountered in clinical practice is that due to infection with the human immunodeficiency virus (HIV), the cause of AIDS. 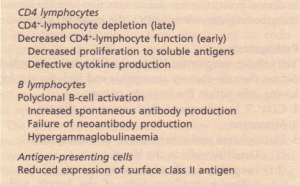 (c) Follicular dendritic cells of the lymph nodes, where much of the early infection and replication of HIV takes place. 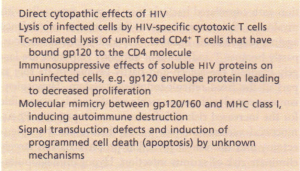 Mechanisms of the immunopathogenesis of HIV. The major defects . 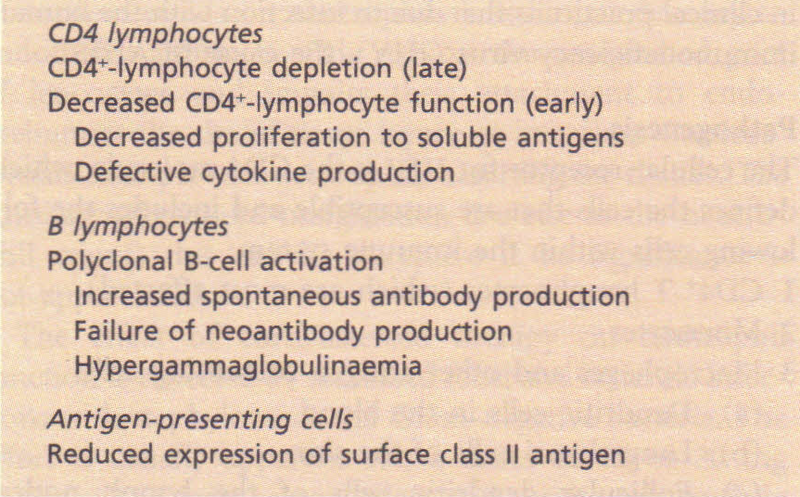 The central and most characteristic is the progressive and severe depletion of CD4+ ‘helper’ lymphocytes. These cells orchestrate the immune response, responding to antigen presented to them via antigen-presenting cells in the context of class II MHC. They proliferate and release cytokines, in particular IL-2 which leads to proliferation of other reactive T-cell clones, including cytotoxic T cells to eradicate viral infections, and interferon-y and interleukin which activates B cells to antibody production, NK cells to cytotoxicity and macrophages to microbicidal activity against intracellular pathogens. Loss of this single cell type can therefore explain nearly all the immunological abnormalities of AIDS as other cells’ function is so dependent on it. 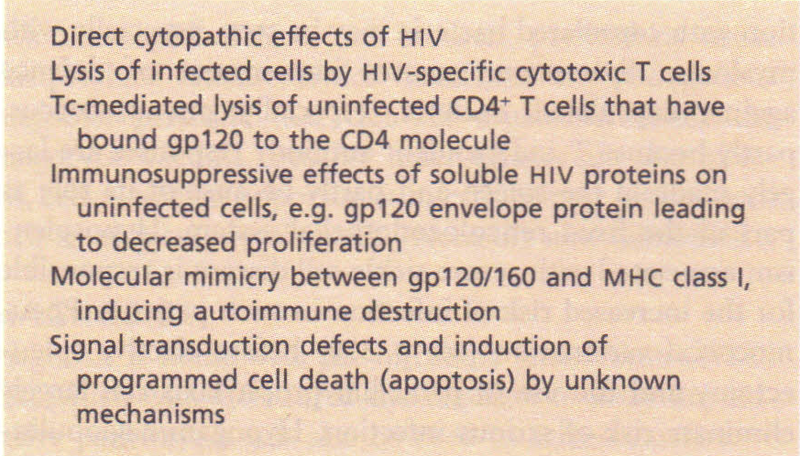 In addition other cells are also affected, if not infected by HIV. Antigen-presenting cells are directly and productively infected; B cells are polyclonally activated by the envelope proteins of HIV. For the presentation and management of HIV infection and AIDS. Measles can cause a transient T-cell immunodeficiency, but it is rarely long-lasting enough for severe clinical problems to ensue. Immunosuppressive therapy with cytotoxic agents such as cyclophosphamide and azathioprine tends to cause predominant Tvcell immunosuppression. Cyclosporin and PK506 are potent immunosuppressive agents which interfere with ‘I’-cell activation mechanisms at an intracellular level. Surprisingly, they are associated with only modest increases in infection, unless combined with corticosteroids or other agents. In such combinations, increased risk of Epstein-Barr virus (EBV)-associated lymphoma has been reported. Antilymphocyte immunoglobulin or monoclonal anti-CD3 antibody therapy also suppress Tvcell responses transiently. 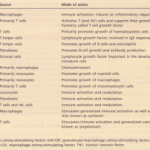 This interferes with cell-mediated immunity, in particular T cell-macrophage cooperation. This is due to effects on T-cell traffic and impairment of macrophage responses to cytokines, together with impaired antigen presentation. Mucocutaneous candidiasis. Pneumocystis carinii pneumonia, cytomegalovirus infection, mycobacterial infection, Nocardia, non-typhi Salmonella septicaemia and cryptococcosis are some of the very many infections seen with prolonged high-dose steroid therapy.